Media: Obama Shazzama, Hillary’s stalking horse. Obama’s Ears – or, Where are the grownups? The confirmation comes from a book written by Mark Bowden, Guests of the Ayatollah: The First Battle in America’s War With Militant Islam. Bowden has produced an in-depth study of the 444-day hostage taking, which included mock executions and interrogations, run by a wildly paranoid group of Khomeini followers. Khomeini himself was utterly misinterpreted by the Carter administration as a peaceful religious figure — Andrew Young called him “some kind of saint” — when of course he turned out to be a murderous fanatic. As President, Jimmy Carter and his NSC Advisor, Zbigniew Brzezinsky, refused to back the pro-American and modernizing Shah against the “peaceful” coup by a coalition of Khomeiniacs and Leftists. The CIA was utterly clueless, and when Khomeini’s articles were translated into English they turned out to be violently anti-Western, anti-American, anti-Christian and anti-Semitic. But the Carter Administration still denied the evidence of its own eyes. Bowden’s important book is reviewed in today’s Real Clear Politics by political scientist Matthias Kuentzen. of the American embassy. 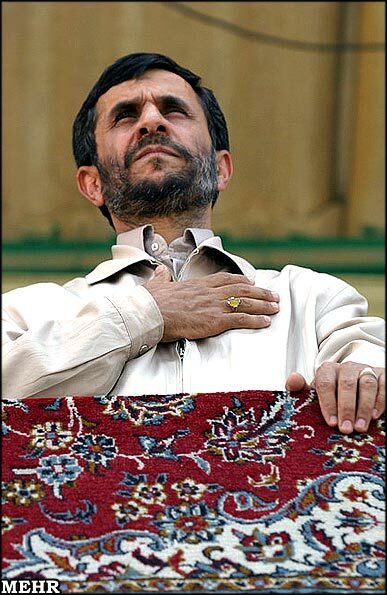 According to then-Iranian President Abolhassan Bani-Sadr, Ahmadinejad was not only present in the occupied compound, but served as liaison between the hostage-takers and Ali Khamenei, at the time one of the most important Friday preachers in Tehran. Khamenei himself, today Iran’s Supreme Leader, visited the hostage-takers repeatedly in the compound. Ali-Akbar Rafsanjani, today Iran’s third most important political figure, was in 1980 the chairman of the Parliament and in this capacity he shared responsibility for the prolongation of the hostage crisis. Today, we are not only facing a second major conflict with Iran, but the West is confronted by the same theological regime, the same ideology of martyrdom — and indeed by some of the same persons. In the obsessive worldview of the hostage-takers, an all-powerful United States was responsible for all the evils of the world. … Every piece of information coming from the embassy personnel, no matter how innocuous, took on a dark, covert significance. Even their digital watches and ballpoint pens were ascribed special powers, such as are otherwise only to be found in a James Bond film. … The contrast between the reality and the phantasm could hardly have been greater. No it’s not comforting, but that is the reality of the Tehran regime we see today. Where is the sudden wave of love for Obama coming from? Like a Relevation straight from Above, the beatification of Barack Obama has now taken off. Our hard-bitten journos are Dreaming of Obama with stars in their eyes. It’s a sight that would have that old news guy H.L. Mencken rolling on the floor in stitches. The Media pretends not to know where all the hype is coming from, as if they didn’t manufacture it themselves. It’s just another sleazy piece of showbiz from our contemptible media industry. It brings to mind the “spontaneous mass demonstrations” that the Soviets, Castro, Kim and the Chinese used to conjuring up at the drop of a hat. But a lot of people fall for it. What is it that makes liberals so gullible? Here is an hypothesis. After all, the media don’t donate their “spontaneous” billion dollar ad campaigns to just anybody. The easiest guess is that Obama is a stalking horse for Hillary. Why the rush to kiss any exposed anatomy on a guy who’s been a Senator for only two years? 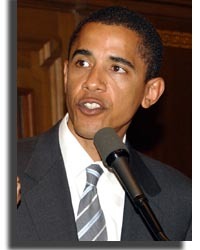 From a Democrat perspective Barrack Obama has the advantage of having no track record at all. So our hype merchants can manufacture whatever image they think will sell. It’s like a Britney Spears publicity stunt — but who’s pulling the strings? It’s got to be the Clinton Machine. Why? Because so many media powerhouses are simultaneously cuddling up to lovable old Obama. One favorable journalist is routine. The whole bizarre gang all at the same time is a plan, probably hatched in some disreputable Washington drinking fest. The Clinton War Machine is by far the most connected operation in the Democrat Party. It’s plain that Hillary Clinton doesn’t want to announce yet. She needs time to maneuver. If Iraq goes bad, Hillary will sound like John Kerry without the raspy voice. If it gets better, she will become a centrist on foreign policy. But while Hillary is zigging and zagging to snaffle the Democrat Left without losing the national center, she doesn’t want any others to start generating excitement. Liberals are utterly famished for power, even with no policy ideas. So Hillary and Bill need a stalking horse to hold the nomination open. It looks like John Kerry’s latest sneer at the expense of the US military was played up by the MSM to nail Kerry’s hopes early on. As for Al Gore, his personal Mission to Save the Planet isn’t having any impact: So the media had to fall in love with a wonderful guy! Here’s a guess: The Democrats are deathly afraid of a GOP ticket with Condi Rice for 2008. There’s no assurance that Dr. Rice is interested, and she probably doesn’t relish the unavoidable mud bath of electoral politics. But the Clintons may have taken private polls showing that a lot of Americans would like a presidential ticket with Condi in the Veep slot. Those are the same voters who might go for Obama at first sight, and for the same reason: They are both Black candidates who seem articulate and knowledgeable. So Hillary might be dangling the prospect of Barack Obama as Veep candidate in order to snap up the undecideds in 2008. Behind the scenes, Bill has probably made a few phone calls to Barack Obama about the glittering possibilities for the future — if he plays along with the Clinton Machine, of course. Neither Obama nor Rice have the domestic political clout to be nominated for president. But Romney-Rice could be an exciting ticket for the GOP, especially if Romney does a better job of learning his lines. Mitt Romney looks like a conservative with a positive program for the future, a Gingrich conservative without Newt’s baggage from the 90’s. A Romney-Rice ticket would attract many Republicans who want a more domestically conservative president, with the added strength and experience in foreign policy. If the Iraq situation settles down by 2007, Condoleezza Rice will strengthen the ticket. She is a most admirable woman. Like Clarence Thomas, Dr. Rice symbolizes the potential for poor and oppressed Blacks from the rural South to leap to top levels of national leadership in a single generation. She is our version of Horatio Alger, a powerful icon of America’s story of hope. So the Leftist media will adore Obama and trash Condi. Tragically, neither her gender nor her race will protect Condi Rice from the fate of Clarence Thomas, Michael Steele, or any other African-Americans who wander off the liberal reservation. At the same time, Condoleezza Rice sends such a powerful message of conservative hope by her values, her immensely hard work, high motivation, and outstanding achievement, that Republicans would be well advised to keep her in mind for 2008. Today’s news is that Maureen Dowd, star of The New York Times Op Ed Page, had the temerity to ask Sen. Barack Obama about his ears. He immediately took her aside and told Ms. Dowd never to mention his ears again, because he, Senator Obama, widely hyped as our New Presidential Hope, is sensitive about the matter. You see, he was teased about them as a child, and hasn’t ever gotten over it. Ms Dowd didn’t apologize, but did something much worse: She explained that it was all for his own good, “to toughen him up,” thereby revealing the NYT’s high standard of journalistic objectivity. Think of FDR as an invalid, Harry Truman’s unsavory associations with Boss Pendergast, JFK’s rum-running dad, LBJ’s magic fortune. Think of Eisenhower, Nixon, Ford, Reagan, Bush I and II. Yes, they had plenty of faults, but they were grown up. Obama’s ear sensitivity is a weird little story, but it’s also a tale of our times. On the Dowd-Hillary-Obama-Bill-Chip side of the political spectrum we are governed by children who have never needed to grow up. Pray we will never be governed by them.